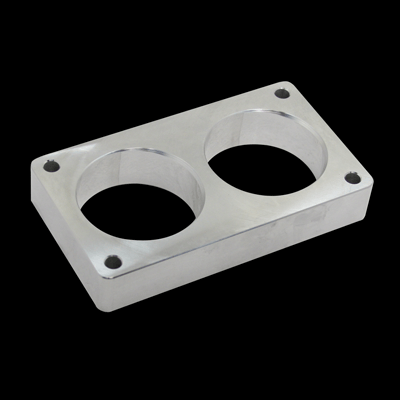 * Brushed Satin Finish Bolt on power for your 2005-2009 4.6 3V this new intake spacer increases plenum volume that improves air intake velocity and raises your engines power and torque by up to as much as 12-14HP / 12-14lbs of torque ! No custom tune needed nor will it trigger the check engine light. Supercharged vehicles see upwards of 12-18HP Increase along with 12-18Lbs. of Torque ! Dyno testing has resulted in up to 12-14HP / 12-14lbs of torque depending on other mods. Our Quality & Finish will leave you with a grin from ear to ear as it is the Best looking unit available for your Ford Mustang. Quality Construction: Made from Billet Aluminum and twin engraved lines all the way around for a great look while being fully functional. Designed to work with the stock throttle body. No one gives you the bold clean styling of our Aftermarket Dress Ups, Suspension and Performance Parts for your American Muscle Car like UPR Products! Installs in 20 minutes or less. Includes all necessary hardware. Fits these Vehicles: 2005 2006 2007 2008 2009 4.6 3V GT V8 Mustang Roush & Saleen Vehicles. Made in the USA!